It will be a sad day tomorrow as we say goodbye to one of the legends of racing that is Andrew ‘lenzio’ Thornton. Over a thousand winners from 29 years of riding, highlighted by winning the Gold Cup on board Cool Dawn. He’s been loyal to the yard and has ridden over 100 winners for us. 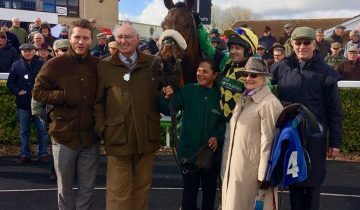 His 1000th winner was on one of our horses, Kentford Myth which was a privilege for the yard. His last ride before retiring is for us on Manhattan Spring and it would be great if he could finish on a winner with one of ours. He has been an inspiration to many young jockeys and I’m sure he will in years to come. He has played a very big part in our operation over the years and will not be easily replaced. I suspect next time I see him, he may well take me up on the offer of a lunch that I would offer him after schooling. Mr Thornton, enjoy your retirement and good luck. Many thanks from all of us at wilsford stables.